Last year, soon after the Coral Rescue, B114, was born, I heard a radio programme about the work of Marshall Rosenberg. He is not so famous, but his work has transformed lives. He devoted his life to developing a way of communicating that supports people to get their needs met. I watched him on YouTube and really enjoyed his way of being and working with people. He is very present, very real, and is an expert in his method. He is also very amusing in his presentations. Marshall's way of working is called Non-Violent Communication. It is built upon some key principles and has guidelines and structures which support people in their communicating. In particular it focuses on people connecting with their true feelings and deeper needs and communicating these in a way that does not criticise or blame the other. It helps people to be real, alive, and it invites the humanity of the person to whom they speak to be touched and awaken. I think it is a very valuable tool to create respect, support and togetherness. In short a positive coral community. B114, the latest Equilibrium bottle is a rescue for coral. Non-violent communication focuses on our truth, not on our interpretations or judgements. A key practice of Marshall's method is built upon the following four steps. These are used when we communicate about a situation we would like to change. These steps are four statements. Each builds upon the information contained in the previous one(s). Therefore i include previous opening phrases as i share the steps below. This opening phrase must be completed with something observable and which is free of any evaluation, opinion or judgement). This phrase must be completed with a true feeling. Words such as misunderstood, oppressed, rejected etc, are not real feelings. In fact these particular examples are doubly dangerous because they also imply a failing or wrongness on the part of the other - something which will most likely trigger a defensive reaction. Even states such as anger, guilt, shame and depression are not true feelings in Marshall Rosenberg's view. They are experiences that include some mental judgement; on the other in the case of anger, or on ourself in the case of guilt, shame or depression. The advice is to find the true natural feeling and state it without reference to the other person. Once you have stated your feeling, stay in your heart and connect with your needs. This is the great key to Rosenberg's work. Feelings and needs. Feelings and needs. It is worth repeating. To connect with our true feelings and needs is to enter the present and connect with that which is real, that which is alive in us. In Marshall Rosenberg's understanding, behind every (difficult) feeling is a need. Find the need underneath the feeling. Express this need without attributing responsibility to the other person. For example " I need honesty " compared to "I need you to tell me the truth" Needs are different to preferences, or requests, or strategies. they do not specify the way it should be satisfied or by whom. Find the need, express it clearly without blame or requirement upon any other individual, this is step 3. 4 So i ask you to (do) …. Identify an action that the person can do which will address your need. It should be positively framed. For example; "I want you to be at home more of the time " compared to "I want you to spend less time at work" (In this latter example the wife was upset when her husband promptly booked onto a golfing holiday). The request should also be: for a clearly defined action, not a state. "Be Happy" or "Love me" are not measurable and therefore not do-able. The request should also be for something which is in the hands of the other person to give. For example "Give me my freedom" is too vague. "Divorce me" is perhaps better. But even then the one suffering may still not have the freedom they desire after divorce if they continue to be angry about the past ... What can the other person specifically do to help meet your need? There is one very important final clause. Please do this thing i ask ONLY if you are can do so joyfully and without condition. This makes it a request and not a demand. Actions made out of fear or obligation only create further problems in the future. These are simple steps. To watch Marshall work though is to appreciate that he has a lifetime of experience arising out of his uncovering, practicing and refining these steps. There are many more skills he brings to the class to support people find their way with the steps. One area his work and mine entirely coincide is in the understanding that nothing needs to be fixed by the "therapist" in the process. Simply the presence of awareness is enough to support life energy itself to find the way to resolve the situation. 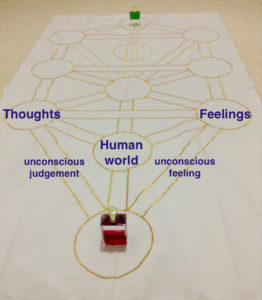 I also have a couple of interesting colour / Tree of Life ideas arising from listening to his method. A Tree of Life connection came to mind. Krishnamurti’s statement is aligned with Djwal Khul, B64 in Equilibrium, Objective Truth, The Ace of Swords in the sphere of Kether at the top of the Tree. This is the element of mind in the place of stillness beyond activity. 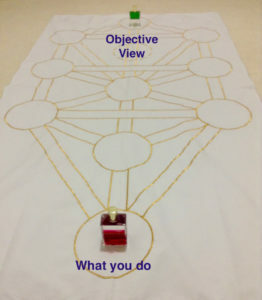 The “When you do …” statement of Step 1 however must refer to something that occurs in Malkuth, the physical world at the very bottom of the Tree. The doing of "when you do" must be an action, something observable to the senses. To see the activity in the world of Malkuth with the objectivity of Kether is thus an interesting proposition in the Tree. It requires spanning the full distance of the Tree from the very top to the very bottom. Moreover, there is also a neat colour perspective here. One of the Equilibrium bottles in Malkuth is B55 The Christ. Clear / Red. it is the complementary opposite of the Emerald Green / Clear of B64 Djwal Khul. One could rephrase step 1 as "I perceive objectively (B64) and comment only on what you do (B55)". The confusion and challenge to seeing clearly what has been done arises in the space between these two extremes of the Tree - the world of action in Malkuth and the world of the absolute in Kether. In particular, there is a swirl of subjectivity which appears in the human domain - that area of the Tree where the lower human self is caught up in thoughts and emotions, not only those which are conscious but also those which agitate in the unconscious paths of the Moon and Judgement. Non violent communication asks us to see clearly, and to speak it clearly into our outer world, and it also asks us to bring clarity into our inner world of feelings and needs. This dimension can now be added to our Tree of Life representation of the elements of Marshall's work. As I listened to Marshall talk about feelings and needs I had a nice insight about locating Marshall's work in the chakras. Yellow is clearly the thinking mind, the separate self that can feel threatened, wants to defend itself, be in the right, etc etc. It is also fairly easy to relate orange with feelings, this is so even though they are also associated with the heart and green. My fresh insight however was around red. Marshall uses the word "needs" and with this word I suddenly made the connection to red. A need is deeper than a want. "Need" implies i cannot do without it. Thus "need" is framed as a survival issue and therefore red. Putting this together, i can see that red needs and orange feelings are the foundation of our experience. Above these two colours is yellow. and it is in yellow that the thinking mind and separate self consciousness have their being. The yellow is the world of Jackal, the clever one who is all tricksy, wants to be right, wants to win. Marshall brings in Giraffe to counter Jackal, telling us that the giraffe has the biggest heart of all the animals. For colour therapist the heart is associated with green. The heart being above the fears and insecurities of yellow is able to open and give to the world. It is very important in Non-violent communication to keep the yellow soft. As Marshall says "When peoples full attention is on our needs, they hear no criticism no demands, it is natural to enjoy giving." As soon as criticism or demand comes in then the yellow begins to be triggered towards defensiveness and we lose connection with the natural desire to give. Orange first and then red; feelings are the doorway to needs. Feelings and needs are engaging and powerful; they stimulate shared human experience and encourage working with people. People will give naturally if they are engaged through their emotions and provided they feel free and unthreatened. The Emperor (B4 in Aura-Soma - Yellow / Gold) has the power to compel people, This is a different kind of power, power over people. This is not a recipe for a healthy community. It is therefore, and this is my final point for today, interesting to see that the Return bottle for The Emperor is B82. Green/Orange. Here is a dissolving of the isolation of yellow, allowing an expansion into the feeling resonance of orange and the natural giving of the green heart. It represents an alternative way for us to each live as the Emperor in the world. Power with people, rather than power over people; being clear and opening ourselves to each other; creating a positive coral community. I am pleased to notice that I am finishing writing this article now just as the Aura-Soma Teacher Update process enters its final hour in Austria. "Power with" or "power over." This is a question that B114 the Coral Rescue must address if the community is to be healthy and truly together. Even though I did not attend the Update and I am therefore officially out of Aura-Soma at the end of this month, the fact that i am prompted to write such a post today, unexpectedly, ( it was not my plan this morning), and that i finish it just now gives me the feeling that I am and will remain attuned to the energetic field of Aura-Soma. For this I am grateful. Thank you May.I appreciate your wishes. Thank you for your sharing. It is very useful and it really matches to the book call “I am OK – you are OK: a practical guide to transactional analysis “which I am reading now. You share a different point of view on their theory. I really enjoyed reading your article about nonviolent communication in relation to colours and Aura-Soma. It was interesting as I often put happenings in Life in relation to colours. This makes colours so real and helps to clarify abstract concepts. I will continue to read tomorrow. Great. I am glad you liked it.